I saw a neat looking clock pattern and purchased the Alpine clock pattern from Cherry Hill Toys. One choice I had to make was how to make the 1/4" maple required to build this clock. 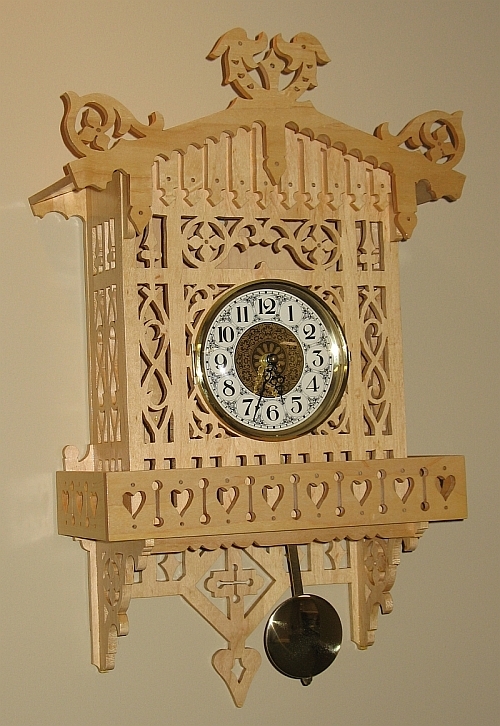 For a previous project, the fretwork shelf clock, I bought 1/4" maple 12 inches wide from a sawmill in Wisconsin. It was beautiful wood and solid pieces versus glued up. The downside was the over $40 cost. I figured it cost $16 more per each of the two clocks I built to use the sold Wisconsin wood versus resawing standard 3/4" Menard's maple. Another option was to try resawing standard 3/4" thick wood from Menard's using the bandsaw. I bought a special resaw blade for my bandsaw. My past experience with standard 1/2" blades was that the blade wandered too much. In some places the thickness was less than 1/4" due to the blade wandering. I was trying to resaw 3/4" thick maple that was 5.5 inches tall when this occurred. A third option was to resaw on the table saw. The problem is that my Piranhau 60 tooth carbide blades requires a 1/8" thick kerf. Doing the math, 3/4" thickness minus 1/8" kerf leaves 5/8 of wood............dividing this in half for the 2 boards produced from resawing allows 5/16" this resultant wood. Since the desired thickness after resaw is 1/4" or 4/16", then the margin of error is only 1/16" (5/16 minus 4/16"). If I had a thinner kerf blade, I could increase the margin of error. I went to Rockler.com and bought a thin Kerf Freud carbide 50T combination blade for $64. This Freud blade has a .092" kerf. Applying the same type of math as above gives 1.264 sixteenths versus 1/16 margin of error. My 10 inch Sears table saw will not raise the blade high enough to resaw 5.5 inch wide maple. I decided to saw the 5.5 inch wide maple in half, or roughly 2.75 inch boards.......then resaw them in 2 blade depth settings. This worked very well and the Freud actual kerf matched the advertised kerf of .092 inch. It is important to make test cuts using 3/4 inch pine to precisely set the resaw blade so the 2 resultant pieces are the same thickness.......before you start resawing the maple. You must also keep the same face of the maple against the fence when you flip it over for the 2nd cut. I almost had all of the boards shown above planed down to 1/4" thickness, when the planer bogged down and quit. I did not blow any fuses. I tried red reset button on 3 hp motor........and would not reset. I had to use the belt sander to finish all of the glued up boards. Have to fix the planer later. You can buy everything from CherryHillToys.com if you want to. When I was entering the clock plan into Sketchup, I checked the width of the back piece, and it was just under 12 inches. I made all of my glued up pieces to 12" thickness because my planer will not take boards wider than 12 inches. When I printed out the pattern for the clock back from Sketchup, I noticed the bottom of the clock back is just under 12 inches, but the top is 13-3/16" or more than 12 inches........Darn! I will have to glue on 2 ears at the top of the 12 wide board to get the needed width! I sawed out 2 pieces from an unused part of the wood blank for the back of the clock....then glued them on for the 2 ear pieces. I used the black plastic 90 degree piece to assure the lower shelf was at 90 degrees to the clock back. On the decorative thin horizontal piece that goes underneath the shelf, I made it a little long....so I could cut the length precisely to fit between the two 90-degree brackets below the shelf. Wow, it is starting to look like a pretty clock!! On the piece above, I did not blue tape both sides. I simply glued the paper pattern on with white Elmer's glue. I rubbed the paper off with a damp cloth. This piece broke when I was rubbing it to remove the glue with the damp rag. Since it is hidden on finished clock, I did not worry about the crack. I made the fence pieces a little longer than the plan. This let me adjust the lengths to match the as-built clock. Because my wood is a hair thicker than 1/4", I need this adjustment ability. It took a long time to scroll saw the large ornamental piece that sets at the top of the clock. Below are more photos of the assembly process. I used the wound string method of clamping the 2 roof pieces to the clock. You just wrap several layers of string around the pieces to be clamped, then use a 16 penny nail to wind up the string and put tension into it. I had to get creative and insert a dowel into the clock to connect the string to. Gluing the 2 side fence pieces is shown above. I made the 2 side fence pieces and 1 front fence piece a little long on purpose, so I could trim them to exact fits on final assembly. Gluing the front fence piece. Gluing the fancy top ornamental piece. I hung the clock on a wire from the floor joyce to varnish it. I did 5 cycles of polyurethane and 220 grit sanding. When selecting which piece of the glued up board blank, account for not having a glue joint where the 2 points on the top ornamental piece project down. This strengthens these tips from breaking. I chose to do an all wood and glue assembly versus having brass nails show on the finished clock. I made the pendulum length just shorter than the bottom of the clock. There is plenty of clearance in the sawn slot for the pendulum to swing.